First of the pioneer jet fighters was the German Messerschmitt Me 262, which made its initial flight on March 25, 1942. In the following 4 years, a number of these pioneer, or first- generation, jet fighters were developed. In basic concept, these aircraft were small extrapolations of the technology of contemporary propeller-driven aircraft of that period. As compared with those which were to appear later, wings were basically straight, with relatively thick airfoil sections, and were not really suited for flight into the speed range above the critical Mach number, The systems for lateral, directional, and longitudinal control were usually manually operated with no power boost. The jet engines used were of low thrust by present-day standards. The performance characteristics of early jet fighters exhibited certain peculiarities as compared with those of contemporary propeller-driven aircraft equipped with reciprocating engines; these differences were related to the manner in which the thrust and power of turbojet engines vary with speed. A reciprocating engine generates the same amount of power at takeoff as at high speeds, whereas the turbojet at the same altitude has nearly the same thrust at both high and low speeds. where the subscripts 25 and 410 refer to speeds of 25 and 410 miles per hour, respectively. The thrust-to-weight ratio T/W of the jet aircraft is small compared with that of its propeller-driven counterpart at low speeds. Thus, the acceleration of the jet aircraft on takeoff will be low; and the takeoff distance, correspondingly long. Because of the high-speed capabilities of the early jet fighters, deep penetrations into the Mach number range characterized by severe compressibility effects were possible. In addition to high drag, a variety of stability, control, and maneuverability problems were encountered. Typical of these was "tuck-under," a condition in which a rapid loss of lift on the wing, together with a change in tail load, caused the aircraft to nose over abruptly. Rapid recovery was frequently hindered by a loss of effectiveness and change in hinge-moment characteristics of the elevator control. Buffeting was a violent shaking of the aircraft caused by unstable separated flow behind the positions at which shock waves  were located on the wings and other parts of the aircraft. Most of these problems had been encountered previously on high-performance propeller-driven fighters when flown in steep dives at high altitudes. The new jet fighters, however, had sufficient thrust at high speed to enter the Mach number range characterized by these difficulties in level flight, or slight dives, over a broad range of altitudes. Resolution of these difficulties came in later generations of jet fighters with thin wings and tails, usually with some sweepback, together with other improvements including powered controls. In the following, five pioneer jet fighters that appeared prior to 1947 are briefly described. Two jet fighters that saw limited operational service in World War II were the German Messerschmitt Me 262 and the British Gloster Meteor. Because of the limited thrust capability of jet engines available at that time, both aircraft were necessarily of twin-engine design to meet desired mission and performance objectives. The Me 262 and the Meteor are illustrated in figures 11.1 and 11.2. Configuration of the two aircraft was similar in that both had engines mounted on the wing outboard of the fuselage and both had a tricycle landing gear that was to become standard on all jet fighters. (The first Me 262 had a conventional landing gear that was abandoned for several reasons, one of which was the runway damage caused by impingement of the hot engine exhaust.) Significant improvements in visibility and ease of ground handling are offered by the tricycle landing-gear arrangement. In the United States, this type of landing gear had already been standard practice on multiengine, propeller-driven aircraft for a number of years; however, some design difficulties are presented by a retractable, tricycle arrangement on a single-engine propeller-driven fighter. Placement of the jet engines in the wings or in the fuselage behind the pilot obviated these difficulties. The axial-flow Junkers Jumo turbojet engines were mounted below the wing of the Me 262. The innovative Junkers engine employing an axial-flow compressor may be considered as the precursor of all large, modern axial-flow engines. An interesting account of the development of this milestone engine is contained in a paper by its designer included in reference 140. ...sections that tapered from a thickness ratio of 11 percent at the engine nacelle to 9 percent at the tip. According to reference 141, the wing was swept back slightly to position the wing aerodynamic center in the correct relation to the airplane center of gravity. (See discussion of Douglas DC-3 transport in chapter 5.) Some increase in critical Mach number, however, probably resulted from the 18.5 leading-edge sweepback. Fowler-type high-lift flaps were provided at the trailing  edge of the wing, and full-span slats were incorporated in the leading edges. The slats were actuated automatically by surface pressures at the leading edge when the angle of attack exceeded a prescribed value. The use of these devices gave the aircraft acceptable landing and takeoff performance with a wing loading of about 60 pounds per square foot. (Within limits, the higher the wing loading, the smaller the wing area and drag area; thus for a given thrust level, the higher the maximum speed.) In addition to improving takeoff and landing performance, the slats improved the high-g turning capability in maneuvering flight. Such leading-edge slats were also a feature of the famous Messerschmitt Me 109 propeller-driven fighter employed by the German Air Force throughout World War II. The stabilizer angle could be varied with an electric motor activated by the pilot to provide rapid changes in trim with speed. This highly desirable feature was used on many later jet fighters. A deficiency in the aircraft was the lack of a speed brake, which is important for speed control in high-performance aircraft. The data in table V show a high performance for the 14 000pound Me 262, particularly in view of the low thrust-to-weight ratio. The speed of 540 miles per hour at 19 685 feet was about 100 miles per hour faster than that of the North American P-51, one of the best of the propeller-driven fighters of the war. The Me 262 seems to have been a carefully designed aircraft in which great attention was given to the details of aerodynamic design. Such attention frequently spells the difference between a great aircraft and a mediocre one. The Me 262 was employed as both a day and night fighter, as well as for ground-attack and reconnaissance operations. Depending upon the mission, it appeared in both single- and two-seat versions. As a fighter, named the Schwabe, it was armed with four 30-mm cannons located in the nose. First encounter with an enemy aircraft was on July 25, 1944. About 1400 Messerschmitt Me 262 aircraft, including all versions, were constructed. Fortunately for the Allies, only a small percentage of these saw action, and effective tactics designed to exploit the performance of the aircraft were not developed in a systematic and consistent way in the various operating squadrons. Follow-on Messerschmitt fighter aircraft, including one with about 40° of wing sweep, were being studied when termination of hostilities put an end to all German aircraft development. Although bearing a number of configuration similarities to the Messerschmitt Me 262, the Gloster Meteor differed in a number of significant respects from the German fighter. The Rolls-Royce Derwent  centrifugal- flow turbojet engines of 3500 pounds thrust each were mounted in the chord plane of the wing rather than below it. The front spar actually passed through the inlet, and the rear spar was split and formed hoops around the top and bottom of the engine. The data in table V show that the wing was of low aspect ratio and had no sweepback. Airfoil-section thickness ratio varied from 12 percent at the root to 10.4 percent at the tip. Simple split flaps for lift augmentation were located on the wing lower surface between the fuselage sides and engine nacelles. These relatively small, ineffective, high-lift devices dictated the relatively low wing loading of 43 pounds per square foot, a value about 63 percent lower than that of the Me 262. As compared with the German fighter, the Meteor was characterized by both higher wing area and drag area. Highly desirable dive brakes were provided on the upper and lower surfaces of the wing between the nacelles and the sides of the fuselage. To clear the jet exhaust, the horizontal tail was mounted high on the vertical tail. Longitudinal trim changes could be made with an elevator tab. An innovation at that time was the pressurized cockpit, which maintained the cabin pressure at a value corresponding to 20 000 feet when the actual altitude was 40 000 feet. Performance characteristics shown in table I give a maximum speed for the Gloster Meteor F. Mk. 4 of 570 miles per hour, or a Mach number of 0.81, at 20000 feet. One source (ref. 162) indicates that at high speeds the Meteor experienced large trim changes, high aileron stick forces, and a tendency toward snaking. Snaking may be described as a self-sustained yawing oscillation; it plagued many of the earlier jet fighters. According to reference 188, numerous modifications were tried in an effort to cure the problem on the Meteor - none of them were entirely successful. (Later research indicated that the problem was probably related to incipient flow separation from the relatively thick airfoil sections used in the tail.) Climb performance of the aircraft was outstanding. The sea-level rate of climb was 7500 feet per minute, and an altitude of 30 000 feet could be reached in 5 minutes. 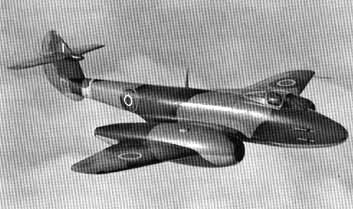 Clearly, the performance of the Meteor F. Mk. 4 was much superior to the performance of the Messerschmitt Me 262A for which data are given in table V. To put this comparison in proper perspective, however, the Meteor F. Mk. 4 did not fly until after the end of World War II and had a thrust-to-weight ratio of 0.47 as compared with 0.28 for the earlier German aircraft. The author's analysis of the physical and performance characteristics of the two aircraft suggests that the superior performance of the Meteor was due to the higher thrust of its engines and not to any inherent superiority in aerodynamic design. The first flight of the Gloster Meteor took place in March 1943, and development and refinement of the type continued for a number of years following World War II. Over 3500 Meteors were built, including versions intended to perform almost every role a fighter might be called upon to fill. For many years, it was used by the Royal Air Force, as well as by the armed forces of 15 other nations. It was the only jet-powered aircraft fielded by the Allies to see action in World War II. In July 1944, a Meteor shot down a V-1 Buzz bomb; and in the spring of 1945, it served the Allies in the ground-attack role. It saw further combat in the Korean war. Although a strictly subsonic aircraft, the Meteor did have high performance for a straight-wing fighter; it was rugged, versatile, and capable of being readily adapted to various missions. An interesting account of the development and operational history of the Meteor may be found in reference 188. 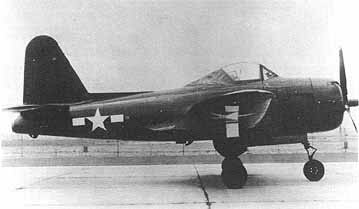 The first jet fighter to be developed in the United States was the Bell P-59 Airacomet; its maiden flight took place on October 1, 1942, about 5 months earlier than the date on which the British Gloster Meteor first flew. Unfortunately, the P-59's performance showed no advantage over that of advanced propeller-driven fighters in use toward the end of the war. Hence, the aircraft was never to fill its intended role as a fighter but served instead as a transition trainer to introduce American pilots to some of the peculiarities encountered in flying jet-powered aircraft. About 60 P-59 aircraft were built. 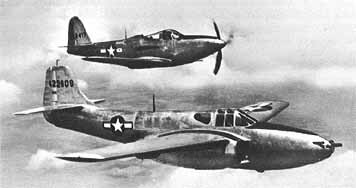 The Bell P-59 is depicted in figure 11.3 flying alongside its ancestor, the Bell P-63 propeller-driven fighter. The P-59 was powered by two General Electric J31-GE-5 turbojet engines (derived from the British Whittle engine) of 2000 pounds thrust each. The engines were contained in pods that blended into the sides of the fuselage, with the exhaust nozzles below and behind the wing trailing edge. The unswept wing was mounted in the shoulder position and had a constant airfoil thickness ratio of 14 percent, which was significantly greater than that used on the wings of the Me 262 and the Meteor. ....contributed to its poor performance, or perhaps the engines did not perform as anticipated. An obvious question concerns the choice of so large a wing area for the aircraft. In comparison with the 60-poundper-square-foot wing loading of the Me 262, the corresponding value for the Airacomet was 28 pounds per square foot. The use of sophisticated leading-edge and trailing-edge high-lift devices on the Me 262 gave acceptable takeoff, landing, and maneuver characteristics with a small wing area and high wing loading on this aircraft. Only small, simple, inboard trailing-edge flaps were used on the P-59A, and the resultant low maximum lift coefficient no doubt played a large part in dictating the choice of a low wing loading and associated large wing area. 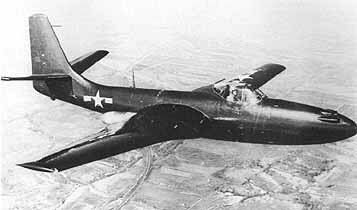 In any event, the poor performance of the P-59A precluded its adoption as a production fighter for the U.S. Armed Forces. The P-59 is included here only because of its historic interest as the first jet aircraft developed in the United States. "Frantic" best describes the pace of some aircraft development programs during World War II. Surely falling into this category was the Lockheed P-80 Shooting Star program. By the summer of 1943,  the poor performance of the Bell Airacomet spelled the need for the development of a new U.S. jet fighter. Lockheed had been making design studies of such an aircraft and in June 1943 was awarded a prototype development contract with the stipulation that the aircraft be ready for flight in 180 days. Completion of the aircraft actually required only 150 days, but first flight was delayed by engine problems until January 1944. ....chapter 5, the P-80 had a small dive-recovery flap near the leading edge of the lower surface of the wing. Again like later versions of the P-38, the P-80 had power-operated ailerons. The other controls were manually operated. Split trailing-edge flaps provided lift augmentation at low speeds. 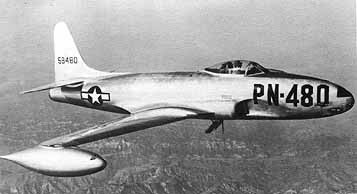 The P-80 came too late for operational service in World War II, but the F-80C did see action in the Korean conflict of the early 1950's. (Note that in 1948 the designation "P" was changed to "F" on all Air Force fighters.) Designed as an air-superiority fighter, the F-80 could not compete in that role with the Soviet-built MiG-15 supplied to the opposing forces by the Soviet Union. It was, however, extensively employed in the ground-attack mode. Armament consisted of six .50-caliber machine guns in the nose and externally mounted bombs and rockets. The F-80 was withdrawn from first-title United States Air Force (USAF) service in 1954; production of the aircraft consisted of about 1700 units. But, this is not quite the end Of the F-80 story. A two-seat trainer version of the aircraft appeared in 19-18. Known in the USAF as the T-33 and in the Navy as the T2V, over 5000 of these trainers were built; a number of them are still in service and can be seen frequently at air bases in different parts of the country. Certainly a long and useful life for an airplane developed in the closing years of World War II. An account of the development and use of the P-80 and its derivatives is given in reference 206. The advent of the jet engine with its promise of greatly improved high-speed performance placed the U.S. Navy in something of a dilemma. As discussed, the early jet engines not only promised increased maximum speeds but also appallingly long takeoff distances. Thus, a jet-powered aircraft seemed incompatible with the short takeoff runs necessary for successful operations from the deck of an aircraft carrier. To be competitive with land-based fighters, however, the Navy needed the high-speed capability of the jet-powered airplane. Proposed as a solution to the problem was a hybrid-type aircraft propelled by a reciprocating engine driving a propeller in addition to a jet engine. Takeoff would be shortened by the high thrust or the reciprocating engine at low speed, and high speed would be ensured by the jet engine. The only hybrid or composite to be produced in any quantity was the Ryan FR-1 Fireball shown in figure 11.5. Except for the tricycle landing gear, the FR-1 looked like a conventional propeller-driven fighter of the World War II time period. A small 1600-pound-thrust jet engine was mounted in the fuselage behind the pilot and was fed by air inlets in the wing leading edge. High-speed performance of the aircraft was similar to that of the P-59A but was in no way competitive with the Lockheed P-80. Takeoff performance was. of course, much improved by the propeller with its reciprocating engine. Fortunately, catapult launching of jet-powered aircraft from the deck of an aircraft carrier provided the solution, still in use, to the Navy dilemma of operating high-performance jet aircraft from carriers. As a consequence, the hybrid concept exemplified by the FR-1 quietly passed into oblivion after production of only 66 aircraft. ...1945, was first operated from a carrier in the summer of 1946, and entered squadron service in 1948. The aircraft was conventional in design and employed an unswept wing with simple high-lift devices; manual flight controls were provided about all three axes. Mounted in the wing roots were the two 1560-pound-thrust Westinghouse axial-flow jet engines. Although not visible in the photograph, the inlets were located in the leading edge of the wing roots. As can be seen, the exhaust nozzles protruded from the wing trailing edge close to the side of the fuselage. Although the thrust-to-weight ratio of the McDonnell FH-1 was less than that of the Bell P-59, the data in table V show the performance of the Phantom to be much improved over the earlier aircraft but not nearly so good as for the P-80. The low wing loading of 36.4 pounds per square foot was dictated by the necessity for a landing speed compatible with operation from an aircraft carrier deck. Because newer aircraft had much superior performance, the short service life of the FH-1 ended in 1950. With much the same configuration, a much improved McDonnell fighter, the F2H Banshee, first flew in 1947. This heavier, more powerful aircraft with higher performance remained in Navy service until the mid-1960's. Total Banshee production consisted of 364 units. The P-80 Shooting Star and the FH-1 Phantom were the first operational jet fighters employed by the armed services of the United States. Both aircraft had unswept wings. A number of other straightwing jet fighters for both Air Force and Navy use appeared after World War II. None of these aircraft showed any major new technical advancement or innovation and hence they are not discussed. Descriptions of these various aircraft may be found in reference 200.